Most of the Russia’s coal in Siberian Region is untapped. Carboniferous coal of Great Lakes and Appalachians region helped USA become a leading industrialized nation. Coal reserves in Ruhr and Rhineland region coupled with rich iron deposits have made Germany a leading industrial super power of Europe. England too benefited immensely from its coal reserves of South Whales, Yorkshire, Manchester, Liverpool etc. Industrial revolution began here mainly due to rich coal reserves. Brazil is a leading coal producer in South America. Most of the coal goes into power generation. Excess production is exported to China. Australia is a leading producer of coal. Most of its coal is exported to China, Japan etc. Australia has rick coking coal deposits. India imports coking coal mainly from Australia. China’s coal is of poor quality. It imports metallurgical grade coal from Australia. South Africa is the only region in Africa with significant amount of coal reserves. World’s second biggest coal producing country. World’s second biggest coal consumer [China first]. 37% of the country’s electricity generation come from coal. Coal mining occurs in 25 states of which Wyoming, West Virginia, Kentucky, Pennsylvania and Texas are the biggest coal producers. Allegheny Mountains and Appalachian Mountains have enormous coal deposits. Most coal now produced in the United States is mined in western surface mines, especially in Wyoming’s Powder River Basin. 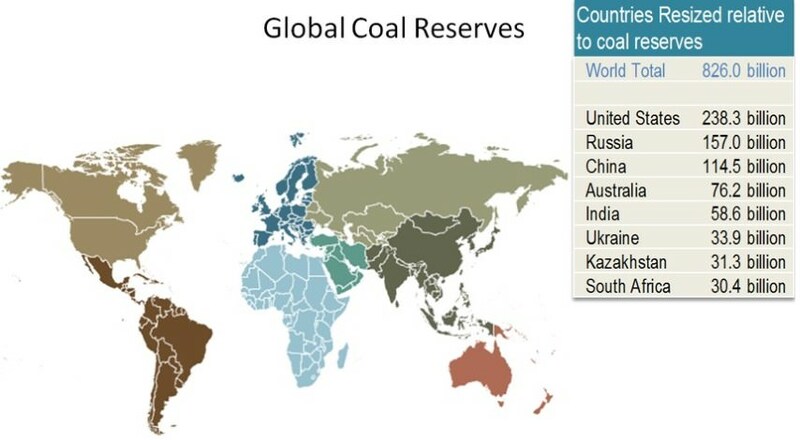 World’s third biggest coal reserves. Largest producer and consumer of coal in the world. Largest user of coal-derived electricity [68.7%]. Industry hugely dependent on Coal. Photochemical smog == Intensifying environmental concerns all over China due to coal burning.